I want to search something on internet - what will i do? Its such a dumb question to even ask your self, isn't? We would of course do "Google" and get what we want. But, yesterday i came across a fascinating search engine. 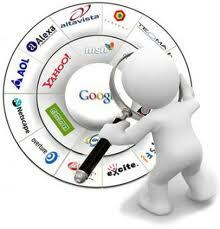 Its a fantastic unconventional but very intuitive way of searching. You can use this to compare Wolfram Search with Google and the nice part about the add-on is that it auto-hides Wolfram from Google pages where there are no Wolfram results available for a particular search query. Let me see..... if i want to know where am i, then how will search? Is it not a wrong question in first place - why will i think "how to search" should i not think "what should i ask"
I would simply ask "where am i?" If we search this way in Google then look at the kind of result we get. But when put the same kind of question in Wolfarm search engine we would get a very intuitive response. This is the kind of response we would getting for many results we get for different queries. 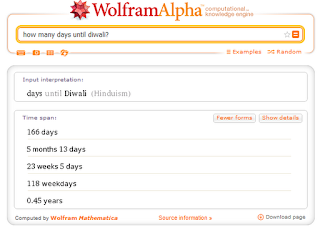 You would normally need an Excel spreadsheet and may have to learn some formulas to perform basic calculations involving date and time but not with Wolfram Alpha. The tool lets you work with dates using natural English. For e.g. 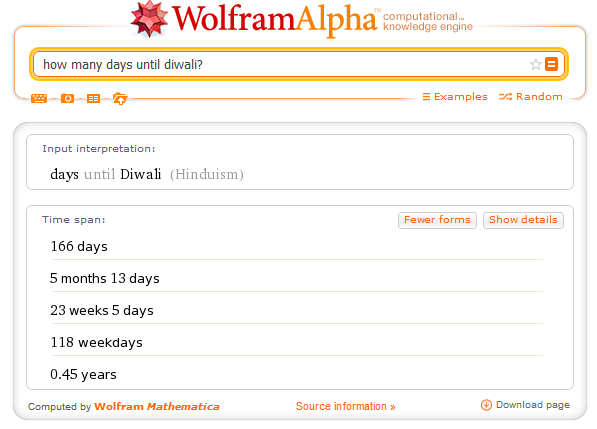 How many days until Diwali? Is it not cool to get an answer like shown in the snap-shot below? Even knowing time zone is pretty cool. Take a look at following question..
Just ask 10:00 PM in London and it will give us the differential hours between our current location (which the engine finds automatically) and the location entered. So, if i am putting this question sitting in India i will get to see the difference as 5.30 hours. However, there are many cool ways of planning our time zones. 90% of Red + 10% of Blue and it will tell you how will that colour look!